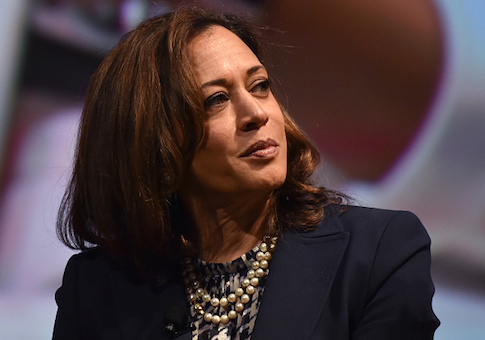 The newly launched Kamala Harris presidential campaign is stacked with top officials from Hillary Clinton's failed 2016 campaign, including her lawyer Marc Elias. The abundance of Clinton staffers joining Harris is unsurprising, as many went straight from the 2016 trail to work in her new senate office in 2017. Those moves were considered a signal to insiders that a presidential campaign may be in the works. The Harris campaign announced on Monday that Elias, Clinton's top lawyer, will be its general counsel; Lily Adams, Clinton's Iowa communications director and daughter of former Planned Parenthood president Cecile Richards, will be its national communications director; Angelique Cannon, Clinton's deputy national finance director and national finance director for Senate Majority PAC, will be its national finance director; and David Huynh, Clinton's director of delegate operations and ballot access, will be its senior adviser. Elias was most recently in the spotlight a few months ago as the top lawyer for former Democratic Sen. Bill Nelson during the Florida recount, which ended with Republican Sen. Rick Scott holding on to his victory. Neither Elias nor the Harris campaign responded to inquiries on whether Elias has agreed to exclusively provide legal services to her campaign, or whether he would be able to work with her potential opponents in the primary. Elias is currently general counsel for the National Democratic Redistricting Committee, a group led by former Attorney General Eric Holder, who is actively considering his own run for president. Harris began stacking her Washington, D.C. congressional office with former Clinton campaign vets almost immediately after making her way to Capitol Hill, the Free Beacon previously reported. In addition to Lily Adams, who was top press aide in the D.C. office, Harris brought in Sergio Gonzales as senior policy adviser. Gonzales was a regional director for Hillary for America. Kate Waters, who worked as the deputy press secretary for Clinton's campaign during the Iowa caucus and as press secretary during the West Virginia primary, Iowa primary, and Nebraska caucus, was brought in as press secretary early in Harris's tenure, among other Clinton vets. The Free Beacon discovered in July 2017 that Harris's Senate campaign was renting office space from a small travel agency on Capitol Hill just a few minutes away from the Capitol and congressional offices. Harris's campaign never answered inquiries on why they were renting the office space 2,800 miles away from her home state. As Harris tapped Clinton campaign vets to her D.C. office—and now presidential campaign—she has used progressive public relations firms to project her message. Harris's presidential campaign's digital arm will be run by Authentic Campaigns, a D.C.-based full-service digital strategy company that was founded by Mike Nellis, former vice president of campaigns of Revolution Messaging LLC. Revolution Messaging was considered instrumental in propelling Sen. Bernie Sanders's dark-horse candidacy against Clinton during the 2016 elections. Harris has already paid Authentic Campaigns and Revolution Messaging millions of dollars from her Senate campaign committee for advertising and consulting services since entering Congress. This entry was posted in Politics and tagged 2020 Election, Hillary Clinton, Kamala Harris. Bookmark the permalink.